We recognized at an early stage that transition-metal alkoxides/hydroxides are perfectly suited to react with various interelement bonds through σ-bond-metathesis-type processes. With our focus on synthetic silicon chemistry, we were particularly interested in the transmetalation of the silicon–boron linkage that yields a transition-metal silanide along with a boron byproduct. The catalytically generated silicon nucleophile then participates in nearly all typical asymmetric carbon–silicon bond-forming reactions, and we have been able to solve several long-standing challenges in enantioselective catalysis involving silicon, e.g., conjugate addition and allylic substitution. The same concept is the basis for our “bioinspired” approach to the catalytic generation of silicon (and boron) electrophiles. Similar to the dihydrogen activation mechanism of hydrogenases, we accomplished the heterolytic splitting of silicon/boron–hydrogen bonds at transition-metal thiolates into sulfur-stabilized silicon/boron cations and a transition-metal hydride. As before, the activation mode is best described as a σ-bond metathesis. By this, we have been able to develop several unique transformations, e.g., electrophilic aromatic substitution with release of dihydrogen to achieve C–H bond silylation and borylation as well as partial reduction of pyridines and related benzannulated congeners. Our laboratory designed a new type of silicon cation where the electron deficiency at the silicon atom is compensated by the metallocenyl group, not by the metal center alone. An extreme dip angle of the silicon atom toward the metal atom is explained by two three-center/two-electron bonds with participation of both the upper and lower cyclopendienyl rings of the metallocene sandwich structure. 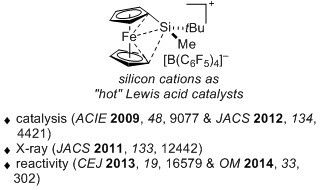 Silicon cations of this family are strong Lewis acids and exceptionally potent in Lewis acid catalysis, e.g., difficult Diels­–Alder reactions at ambient or even lower temperatures. With our expertise in silicon chemistry and Lewis acid catalysis, we became involved in the recent topic of frustrated Lewis pair (FLP) chemistry. 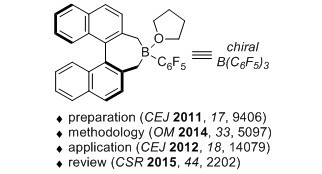 Our contribution lies in the preparation of new chiral derivatives of the electron-deficient boron Lewis acid B(C6F5)3 and their application in enantioselective reduction of C=X bonds. Also, we are investigating the mechanisms of the Si–H bond activation and subsequent steps both experimentally and spectroscopically (see below). from the methylene group, thereby generating a Wheland intermediate that either releases a silylium ion or proton. The net reaction is a two-step formation of H–/Si+ or H–/H+. The latter is rather unexpected as the corresponding Wheland complex is a high-energy intermediate. These processes have been coupled with reductions catalyzed by the same Lewis acid. 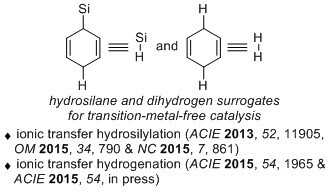 Ionic transfer hydrosilylation had been totally unprecedented, and transition metal-free transfer hydrogenation employing cyclohexa-1,4-dienes as reducing agents is exceptionally rare. test their kinetic competence in catalytic cycles. 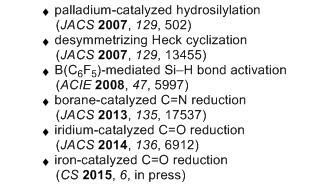 These investigations have been crucial in the mechanistic understanding of fundamental processes such as catalysis with B(C6F5)3 (and related FLP chemistry) and Brookhart’s pincer complex. Over the course of the years, we have tackled less-conventional topics in the rapidly developing field of C–H bond activation. 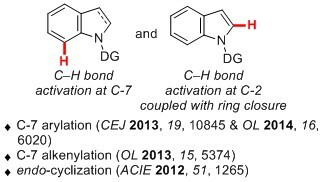 Our major focus is on C–H bond alkenylation, and we are currently elaborating procedures for the site-selective C–H bond functionalization of the indole core. Broadly applicable C-7-selective arylations and alkenylations have already been reported by us. Another open challenge in C–H bond alkenylation is control over the double bond geometry with internal alkenes as coupling partners. The poor reactivity of substituted alkenes is also problematic. By the use of an alkene tethered to the directing group (DG), we realized an unusual endo ring closure; cleavage of the tether afforded fully substituted alkenes with complete diastereocontrol.